To achieve this, significant numbers of Irish farmers are turning to zero-grazing to make use of fragmented farms or of faraway fields, while lowering the feed costs of housed cows, or improving grassland utilisation. 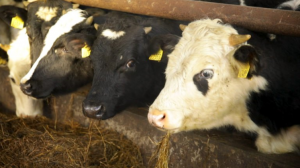 Recent Agri-Food and Biosciences Institute (AFBI) research in Northern Ireland has indicated an increase of 15% in grass utilisation in zero-grazing systems, compared to conventional grazing systems. This improvement often comes from the ability to achieve consistent grass residuals of 1,600–1,800kg of dry matter per hectare (DM/ha), along with reduced rejection sites (in conventional grazing systems) which are associated with excreta or urine spots. Zero-grazing also provides the opportunity to cut at higher grass covers (more than 3,500 kg of DM/ha) which would otherwise be challenging in a grazing system. When selecting appropriate fields for zero-grazing, it is important to take account of field size, previous use, and access. 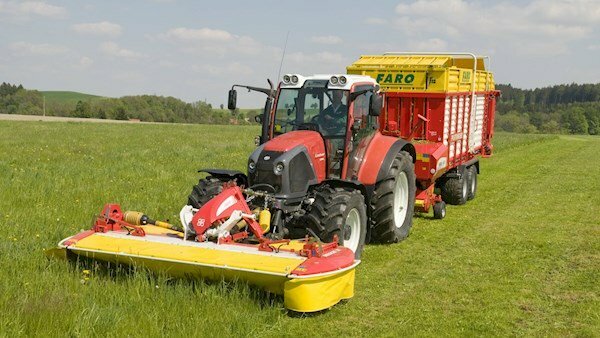 Although using large fields for zero-grazing often makes cutting easier, employing very large areas can delay fertiliser applications and can reduce growth rates. 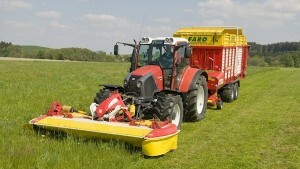 Square or rectangular fields are easier to cut, and for improved grass utilisation. Using fields which have been grazed within the past month is best avoided, because it carries a risk of harvesting grass which has been contaminated with manure. This has the potential to lower cow intakes and increase the rate of spoilage of grass at the feed barrier. Having appropriate access points is key to minimising the risk of soil compaction in any field. Research carried out in Scotland (funded by the UK’s Agriculture and Horticulture Development Board) showed that compaction from machinery and livestock can reduce grass yields by as much as 22%, also impeding soil drainage and nutrient efficiency. Within zero-grazing systems, having multiple, wide entrance and exit points is essential to minimise any risk of soil damage. Research has shown that with a good network of entrance points to paddocks, zero-grazing can reduce overall field compaction by 10%, when compared with grazing systems. Good sward management is essential to optimise cow performance, with zero grazing. This involves selecting the right sward and applying the correct rate of fertiliser. Recent research in Northern Ireland has shown that, compared to grazing, zero-grazing reduces the density of ryegrass plants over the course of a season by as much as 16%. Although this may not have a negative effect on grass yield, it creates a more open sward, and may increase the risk of soil damage, particularly on wet soils. When reseeding, selecting varieties with a higher sward density may help combat this. The frequent cutting used in zero-grazing systems can change the structure of the grass, influencing the management of zero-grazed grass. Spraying for weed control in the main grass growing season can be challenging. Spraying management at the shoulders of the season will reduce the risks. Nutrient requirements for swards managed under zero-grazing systems will be greater than those under grazing systems, due to the lack of returned nutrient from grazing animals. It is crucial to take this into account when developing a nutrient management plan. 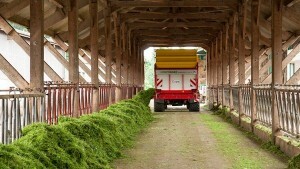 The best method when considering nutrient requirements for zero-grazed swards is to work backwards from the recommendations for silage swards, taking account of the lower yield of zero-grazed swards (typically 70-75% of silage yield), while distributing the fertiliser applications more frequently throughout the season. According to AFBI, targeting pre-cutting covers of 3,500 kg DM/ha will help achieve high palatability of fresh cut grass. To achieve this, aim for a rotation length of 21 days in May, increasing to around 28 days in August. When calculating the rotation length, remember to take into account the rates of grass growth and herd demand. The dry matter (DM) content and water-soluble carbohydrate (WSC) content of grass increases throughout the day, with peak DM content usually observed in the early to mid-afternoon, in dry conditions. Harvesting at this time will minimise the risk of grass spoilage (low-DM grass deteriorates more rapidly). In wet conditions, flexibility is key, and cutting should be done when the sward is at its driest, if possible. Buffer feeds may be required in wet weather conditions, when the DM is low. Although specialist machinery has been developed for zero-grazing systems, some farmers have opted to use cheaper alternatives, such as double-chop harvesters. Recent research in Northern Ireland assessed grass and animal performance resulting from different machines. wo groups of dairy cows were fed fresh grass harvested either by double chop or specialist zero-grazing machinery. The results showed that grass harvested by specialised zero-grazing machinery resulted in improved daily intake and milk yield. However, there were no improvements in milk quality. Cutting grass with the double chop harvester resulted in a marginal reduction in grass quality, compared to specialised zero-grazing machinery. AFBI analysis confirms that a typical Holstein Friesian cow can eat about 15 kg of grass dry matter per day. Based on swards cut with covers of 3,500 kg of DM per hectare, and leaving a residual cover of 1,800 kg, there will be a requirement to cut 1.1ha of grass on a daily basis, to meet the needs of a 100-cow herd. This is based on a forage utilisation level of 80%. What impact does zero-grazing of heavier grass covers have on animal performance and grass utilisation? During the summer of 2017, AFBI in Northern Ireland compared animal and sward performance for two groups of housed cows offered fresh grass harvested from low cover swards (3,500 kg DM/ha) or high cover grass swards (4,500 kg DM/ha). Cows were housed full time and offered fresh grass twice daily, with additional concentrate feeding in the parlour at a rate of 6.4 and 4.7 kg DM/day for cows and heifers respectively. Grass utilisation, grass intake, and animal performance were measured over 110 days. The results showed that feeding grass from the high cover swards had a negative impact on grass production, with an average reduction of 14 kg DM/ha/day in grass growth rate, compared to the low cover swards. Grass utilisation and quality were also reduced in the high cover swards, with an increase in acid digestible fibre (ADF), and a reduction in metabolisable energy (ME) content observed. This impacted on grass intake, with animals on the low grass cover treatment consuming 0.9kg DM/cow/day more than the high grass cover treatment. Cow performance was also impacted by the pre-cutting sward cover, with daily milk yield increased by 1.8 kg/cow/day when cows were offered grass from low grass cover swards, compared to the high cover treatment. An uplift of 0.2 kg/cow/day in milk fat plus protein yield was also evident on the low cover treatment.